The High Country in north-east Victoria is a special place with scenic alpine landscapes, a host of outdoor activities, gourmet food and wine and a fascinating heritage of bushrangers, horsemen and gold. Whatever the season, there’s indulgence to be had in delectable cool-climate wines and innovative cuisine prepared by passionate local chefs in the gourmet villages of Beechworth and Milawa. The Muscat Trail leads to Rutherglen’s wineries while smaller Bright and King Valley villages are perfect for a leisurely cycle to stock up on just-picked local produce. 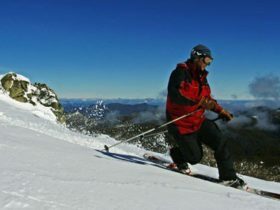 During the winter, the High Country is home to Victoria’s best snowfields, such as Mount Buller, Mount Hotham and Falls Creek with their excellent skiing, snowboarding and accommodation options. When the snow disappears the outdoor opportunities increase, from four-wheel driving, mountain biking and horse riding to hiking on the high plains. Rock climbing, river rafting and fabulous freshwater fishing on the Delatite, Jamieson and Howqua rivers also beckon. There is stunning scenery year-round in the High Country. The alpine villages are crowned in pristine white during winter and cloaked with wildflowers in summer. Bright’s majestic tree-lined streets are alight with colour during autumn. The region’s fascinating gold rush and bushranger heritage can be uncovered in its historic towns and villages. Beechworth boasts grand nineteenth century buildings while Glenrowan is awash with historical sites and attractions documenting the last stand of Australia’s most famous bushranger, Ned Kelly. The proud and enduring spirit of cattlemen and rugged adventurers is on display in Mansfield. The Great Alpine Road, one of Australia’s great touring routes, winds between Wangaratta, Bairnsdale and the Gippsland showcasing stunning alpine landscapes, heritage towns, and local food and wine. The High Country is easily accessible from Melbourne on the Hume Highway and the all-weather sealed Great Alpine Road.